Let’s check out the Kpreps Rankings to see how things stand as we prepare for second-round playoff action this week. Top-ranked Derby scored all 41 points in the first half in defeating Lawrence, 41-7. Hunter Igo completed 10 of 11 passes for 177 yards and four touchdowns in the victory. Lawrence Free State played without starting quarterback Malik Berry and two starters on the offensive line, but beat Wichita North, 61-18. Jax Dineen ran for 130 yards on six carries to surpass 1,000 yards for the season. Gardner-Edgerton stays in the No. 3 spot after beating Blue Valley Northwest, 55-27. Jacob Hunsperger rushed for three touchdowns and 153 yards, while Teven McKelvey passed for a touchdown, rushed for a touchdown, and caught a touchdown pass. Shawnee Mission East moves up one spot to No. 4 this week after a 45-0 victory over KC Harmon. The Lancers scored all 45 points in the first half in handing Harmon its 30th straight loss. Topeka High fell one spot in the rankings after surviving a scare from 13-seed Hutchinson, 45-43. Gregorio Leonardo kicked a 24-yard field goal with :35 seconds remaining to top the Salthawks. Topeka trailed 28-9 at halftime as Hutchinson used a ball-control offense, an onside kick, and a turnover to keep the ball away from the Trojans. Leonardo also kicked a game-winning field goal as time expired two weeks ago to defeat Emporia, 27-26. St. Thomas Aquinas cruised to a 69-14 victory over Topeka Highland Park. The Saints scored 55 points in the first half and rushed for 345 yards in the game. Second-ranked Wichita Northwest got more than 215 rushing yards and three scores from Breece Hall in beating Salina South, 58-24. The Grizzlies will host 8-seed Emporia this week. Maize remains ranked third this week after opening bracket play with a big win over Liberal. The Eagles defeated the Redskins, 56-15, after building a 42-0 lead at halftime. Senior quarterback Caleb Grill passed for 473 yards and four touchdowns in the victory. Bishop Carroll held on to defeat Newton, 40-34. The Golden Eagles got a big game from senior running back Jackson Nichols. Nichols rushed for 283 yards and three scores to help eliminate the much-improved Railers. Fifth-ranked Mill Valley eliminated Topeka West, 49-10. Jordan Preston threw three touchdown passes and Tyler Green rushed for two scores for the Jaguars. Mill Valley will now host 12-seed St. James Academy. The Jaguars defeated the Thunder 14-13 back in Week 2. Bishop Miege scored 62 points in the first half in rolling past Labette County for a second consecutive season. Miege linebacker returned an interception and a fumble for a touchdown in the first half in addition to the Stags’ offensive output. Quarterback Sam Pedrotti threw three touchdown passes in the win. The Stags will travel to No. 3 Pittsburg this week. McPherson continued its string of blowout victories by dispatching Independence, 71-13. Senior quarterback Kyler Hoppes passed for 326 yards and six touchdowns as the Bullpups scored 65 points before halftime. Pittsburg defeated Spring Hill, 37-15, to advance to the next round of the 4A playoffs. Brett Freeman and Dylan White each scored twice for the Purple Dragons. Fourth-ranked Louisburg defeated Ottawa, 56-8, to improve to 9-0. It was the Wildcats’ second win over the Cyclones in three weeks. Louisburg defeated Ottawa 25-0 in Week 7. Finally, Paola also picked up its second win over Baldwin this season. The Panthers beat the Bulldogs 45-6 behind two touchdowns each by Brendan Ohlmeier, Connor Hasz, and Seth Richmond. Paola beat Baldwin 42-0 earlier this season. Andale defeated Halstead, 35-0, to record its sixth shutout of the season. The Indians led 14-0 at halftime and scored twice in the third quarter to put the game out of reach. Andale hosts Chapman (7-2) this week. Sabetha won for a 16th straight time by eliminating Jefferson West, 32-7. The Blue Jays will host Perry-Lecompton this week in a rematch of a classic regular-season game won by Sabetha, 35-33. Scott City shut down Nickerson in advancing to next week with a 38-0 shutout. The Beavers held Nickerson to less than 75 yards of total offense. Brandon Winderlin and Wyatt Hayes each scored two touchdowns. The Beavers will take on Beloit this week in a rematch of a Week 6 meeting won by Scott City, 55-12. Travis Theis rushed for 367 yards and five touchdowns to help No. 4 Pratt to a 52-27 victory over Concordia. The Greenbacks rushed for 611 yards in the game. Pratt will host Colby (8-1) this week. Galena recorded its fourth shutout of the season in blanking Anderson County, 40-0. Bulldog quarterback JC Shelton accounted for three scores. Galena has now won at least nine games in a season for the second consecutive year and only the fourth time in the past 15 seasons. The Bulldogs will host CNC League rival Frontenac this week after beating the Raiders 47-0 earlier this season. 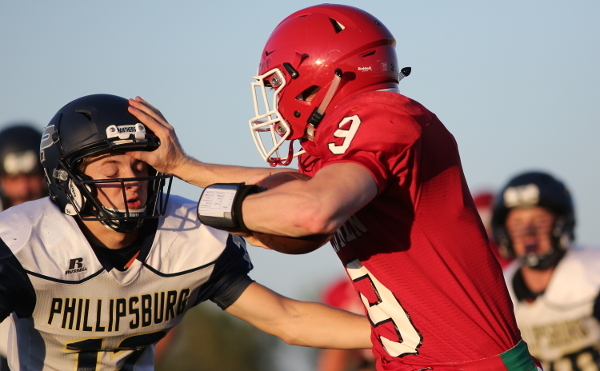 Top-ranked Phillipsburg cruised to a 55-12 opening-round victory over Southwestern Heights. The Panthers will now host Lakin (8-1) this week. Silver Lake remains slightly ahead of Conway Springs for the No. 2 spot in the poll. The Eagles opened the playoffs with a 66-0 win over Riverton, while Conway Springs scored on its first three offensive plays in routing Eureka, 66-6. Fourth-ranked Hutchinson Trinity Catholic rolled to a 58-0 shutout of Belle Plaine to earn a rematch with Garden Plain. The Celtics defeated the Owls, 20-7 earlier this season in district play. Humboldt trailed for the first time this season, but that was only a slight delay in the Cubs’ 52-15 win over West Franklin. Humboldt led 30-15 at halftime and scored three more times in the second half. Top-ranked Smith Center held Oakley to 115 yards of total offense in shutting out the Plainsmen for a second time this season. Smith Center won this meeting 35-0 after winning 42-0 earlier this year. Camden Hoelting caught a pair of touchdown passes and returned two punts for scores as No. 2 Olpe rolled to a 61-0 victory over Uniontown. Olpe defeated Uniontown 48-6 earlier this season. Elkhart defeated winless Sublette for a second time this season, winning 70-22. Elian Prieto rushed for 147 yards and two scores and Chance O’Hair added 100 yards and three touchdowns for the Wildcats. Centralia won for the seventh straight week as the Panthers built a 36-0 halftime lead in beating Jefferson County North, 36-14. Finally, Jackson Heights struggled but scored twice in the fourth quarter to overtake Northern Heights, 36-28. Northern Heights (2-7) returned the opening kickoff for a touchdown and passed for 318 yards against the Cobras. The Wildcats led 20-8 in the first half before Jackson Heights came back. Central Plains registered its seventh consecutive shutout in beating South Gray, 50-0. The Oilers have allowed only 22 points all season and haven’t allowed any point since Week 2. Central Plains will host Ness City this week. The Oilers defeated Ness City, 30-14 in the season opener. Clifton-Clyde remains in the No. 2 spot this week after a 60-14 win over WaKeeney-Trego. The Eagles will host defending-champion Hoxie (8-1) this week. Saint Francis posted a 46-0 shutout of Stockton to remain unbeaten. The Indians will take on traditional eight-man power Victoria this week. Hodgeman County won a tough battle with Moundridge, 38-20. The Longhorns get a rematch with rival Spearville this week. Hodgeman County ended a four-game losing streak to Spearville with a 54-8 win over the Royal Lancers earlier this season. Finally, South Central passed for four touchdowns in order to eliminate Cedar Vale-Dexter, 50-0 on Friday. The Timberwolves will take on Central Burden (6-3) this week. Hanover shifted into playoff mode with ease in blanking Southern Cloud, 54-0. The Wildcats will take on Frankfort this week. Hanover defeated Frankfort 46-0 just two weeks ago. Axtell rolled to a 58-12 win over Pike Valley. Quinn Buessing threw three touchdown passes to Hunter Koch in the game to give Koch the new state record for single season touchdown receptions (30) and career touchdown receptions (60). Axtell will travel to Mankato for a showdown with Rock Hills this week. Third-ranked Osborne rolled to a 48-0 shutout victory over Triplains-Brester behind four touchdowns from junior Darrien Holloway. The Bulldogs will host Sylvan-Lucas Unified (6-3) in a rematch from a game played earlier this season. Osborne won the first meeting, 60-14. Fourth-ranked South Barber scored 78 points in the first half in beating Satanta, 78-14. Meanwhile, fifth-ranked Otis-Bison tallied 60 points in a 60-12 win over Pretty Prairie.